The actual name of the Fabricants that resemble birds is unknown. 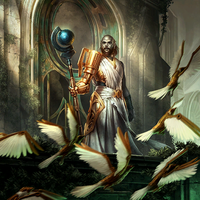 During the second era, daedric crows invaded the clockwork city along with Nocturnal and surprised the people of the city as winged creatures seemed foreign to them. 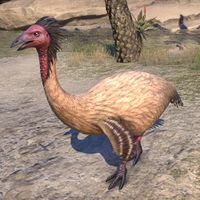 No living bird up to that point are believed to have set foot in Clockwork City,  and so likely the creation of the Fabricant bird was sometime after the Souless One's journey in the Clockwork city in the 2E 583. Factotums are mechanical constructs that are usually humanoid in appearance created by the Clockwork God, Sotha Sil. An invention of need, they were created to maintain his great creation, the Clockwork City. As such they have become an integral part of daily life for the inhabitants of the city, and are vital to running its everyday processes. Believed to be a fusion of brass and soul, factotums have a shared appearance, voice, and sense of purpose. They hold a structured intelligence, often centered on their singular function. Their dialogue and actions are all based on this function, with only the commonality of a devotion to the Clockwork God. Attempts to deviate from this purpose is simply incomprehensible to them. The Factotum's very nature and materials informed the creation of the mechanical enhancements granted to Clockwork Apostles, resulting in a synthesis of flesh and engineering. Similar to factotums are the constructs known as fabricants, but they differ in that they are part organic, part inorganic, constructed from an amalgam of grown flesh and metallic grafts and are more bestial in appearance. 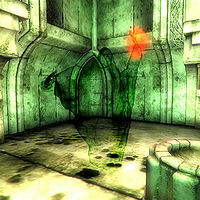 A weaker form of wraith, with a translucent appearance. 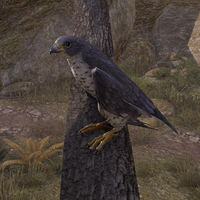 A bird found in Valenwood. The Falmer are blind, corrupted descendants of the ancient Snow Elves that live deep beneath the surface of Skyrim. 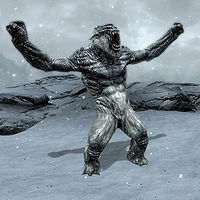 They are known to stalk and attack intruders in various underground areas, primarily Dwemer ruins. 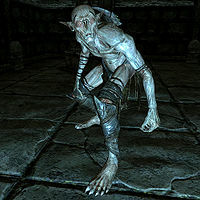 Adventurers can often quickly tell when the Falmer inhabit a place thanks to their odor, which is said to be repulsive. They have been known to come up to the surface to attack the unwary. They are roughly man-sized, but hunched over and "ugly", resembling creatures of goblin-kind more than their own Mer ancestors. They have no noses, only long slits for nostrils. Their ears are distinctly pointed, their skin pallid, and their eyes lifeless and black. Much as "High Elf" and "Wood Elf" are interchangeable terms for "Altmer" and "Bosmer" respectively, "Snow Elf" is really just another term for "Falmer". 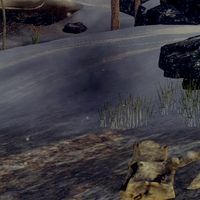 The Snow Elves were a proud and prosperous race of mer who occupied a portion of modern-day Skyrim until they were displaced by the invading Nords. Many of the ancient Snow Elves were betrayed in a deal for asylum they struck with the Dwemer. The Dwemer forced their wards to subsist only on toxic fungi which twisted them into sightless slaves. It's the descendants of these slaves who many of the people of Tamriel have come to know as the Falmer, while their grand ancestors are remembered as Snow Elves. The Falmer were able to adapt to life underground, but have lost the sophistication the Snow Elves exhibited. For garments, they wear only rags and leathers. They live in tents and huts, employ traps to guard their territory, keep chaurus as livestock, and utilize roughly-made weaponry and tools. Some still demonstrate an aptitude for magic. Perhaps most curiously of all, somehow their souls have shrunk; unlike all other Mer, not are all of their souls the same size, and one does not need a Black Soul Gem to capture one of their souls. Few know that an unknown number of Snow Elves rejected the Dwemer's deal and went into hiding, or that some of them survived, uncorrupted, into modern times. Knight-Paladin Gelebor of the Chantry of Auri-El, the only known Snow Elf still alive today, embraced the distinction between "Falmer" and "Snow Elf" due to the negative connotations "Falmer" had taken on among travelers over the millennia, but he personally knew his fallen brethren as the Betrayed. 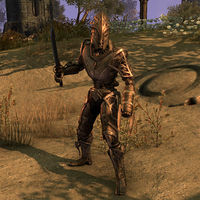 Falmers are cited in Skaal legends of Solstheim as "servants of the Adversary" and "evil beings". A type of shark that can be found in Coldharbour. Fellrunners are flightless birds found in the desert. Felsaad Tern are birds with black feathers in the head and white feathers in the rest of the body. They can be found flying around in Solstheim. 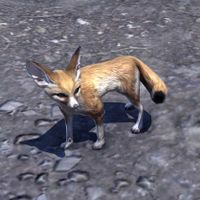 Fennec foxes are a type of fox found in the desert. 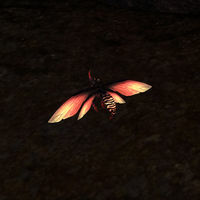 Fetcherflies are insects found on the island of Vvardenfell. 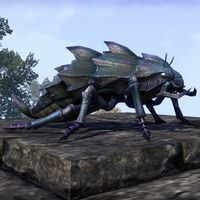 Fiendroths are small blue insectile Daedra. A type of fish that can be found in Glenumbra. A type of fish that can be found in the warm waters of Hew's Bane. A type of fish that can be found in Vvardenfell. 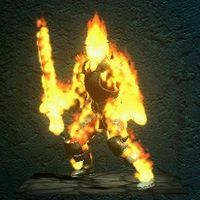 The Fire Atronach is a magical, fire-enchanted creature. Some are artificially constructed as a sort of golem. Others are actually daedra, akin to the Flame Atronach. It is advised to use cold based spells when attacking one, as any fire spells actually heal the creature instead of damaging it. Be careful not to approach too closely, as it gives off great heat which can damage an adventurer if they get too close. This Elemental Daedra is one of the more mundane, but dangerous, daedra from Oblivion. Slightly intelligent with some spell casting abilities, it can only be harmed by mithril or better weapons and is greatly resistant to fire based spells. See also: Flame Atronach. These creatures are from the netherworld, often gating themselves into our plane of existence on some errand of their choosing. They are dangerous foes, highly intelligent, completely chaotic in nature, and powerful in the ways of magic. Fire wyrms are ethereal dragon-like creatures that emerge from the corpses of those slain by the fire breath of a powerful Tongue. A type of fish that can be found in the planetouched waters of the Imperial City. This flesh enchanted golem is a powerful foe which damages opponents if they get too close. 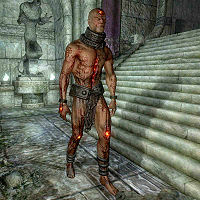 A Flesh Atronach supposedly serves as an animated flesh shell for the spirits/souls of other Daedra, and appears as a sewn-together conglomeration of skin and muscle adorned with mystical symbols, wearing an iron collar. Flesh Atronachs have multiple orbs/gems on their bodies, the color of which depends upon the variety of Flesh Atronach. They are healed by poison and their magicka increases if hit by spells. It is hinted that they were created by Relmyna Verenim after her discovery of the "Flesh" element, however some reports indicate otherwise. Fleshflies are blood-colored, sand-grain-sized insects that feed on human flesh, deforming the faces of those unlucky enough to be caught by their swarms. They can be found in the Black Marsh and southeastern Cyrodiil. Floaters are creatures native to the Bend'r-mahk region of Hammerfell. They have blue skin and a body resembling an umbrella, composed only of beady eyes atop a maw filled with fangs which they rapidly open and close in order to stay in the air. Floater sacs presumably also play a role in keeping this creature airborne, although they are mainly known for having useful alchemical effects. Floaters can carry disease and have been known to sometimes poison their opponents. A type of fish that can be found in Reaper's March. A type of fish that can be found in Craglorn. Foxes are small, non-aggressive creatures found in the wilderness, often seen chasing rabbits and will usually run away when spotted. 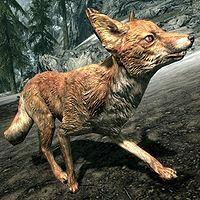 Some are kept as pets by Skyrim's inhabitants. Their pelts are often sold by hunters. Snow foxes can be encountered in the colder regions of Skyrim. A fox is one of the many animals carved into puzzles in the Nordic ruins. Shor is often depicted as a fox. 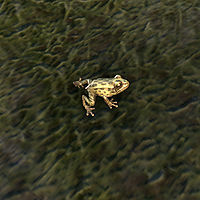 Frogs are small amphibians that can often be found around water. This powerful Elemental Daedra not only causes damage with its vicious physical attacks, but also from the extreme cold aura it generates, which makes it immune to cold-based spells. Frost Atronachs can be summoned by mages, and are often hunted as a source of Frost Salts. 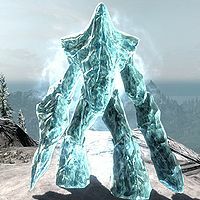 It shares many similarities with the Ice Atronach, though those may be golems or Daedric in nature. See also: Frost Daedra. 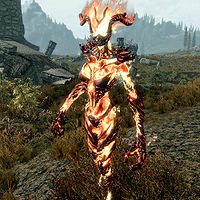 Similar to the Fire Daedra, this common Elemental Daedra can only be hit by mithril or better weapons and can cast cold based spells. See also: Frost Atronach. Frost Giants are a sentient race of very large humanoids. They possess five eyes, and have two curved horns decorating their forehead. White, shaggy hair covers their bodies. They are extremely strong and have regenerative abilities that are stunted by fire. Frost Giants are elusive and rarely seen on Tamriel. Although horselike in appearance, Frost Mares are composed of solid ice. The Mages Guild theorized that the creatures originate from the Fourth Sinus of Takubar. 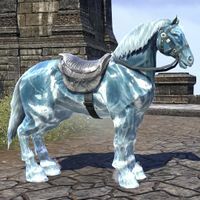 Frost Mares are rarely used by mortals as mounts. Trolls are large, ape-like humanoids endowed with three eyes. Their powerful arms and claws deal massive physical damage. Trolls are also very strong defensively, possessing a particularly effective ability to quickly and fully regenerate health. Their greatest vulnerability is to fire, which not only damages them, but also impairs their capacity to self-heal. 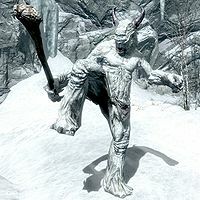 Frost Trolls are stronger variants of the generic Trolls, often found in the higher elevations of Skyrim. 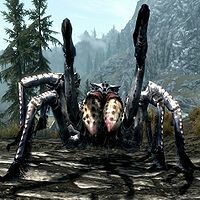 Frostbite Spiders are giant arachnids native to Skyrim. They can be found in their underground nests, or roaming the wilderness. Their lairs are often covered in webs, which can cause obstructions. They spit poisonous venom at their prey from a distance, and leap at them to attack with pincers if they get too close. Frostbite Venom is often harvested from the spiders for use as a poison. Spider Eggs can be taken from the sacs in their web for use in alchemy. A type of fish that can be found in Stonefalls. This page was last modified on 1 April 2019, at 00:12.